COLLEGE PARK, Md. — Redox Power Systems LLC and University of Maryland researchers have partnered to deliver breakthrough fuel cell technologies for providing always-on electricity to businesses, homes and eventually automobiles, at about one-tenth the cost and one-tenth the size of current commercial fuel cell systems, university and company officials jointly announce today. Those fuel cells, based upon patented technology developed by Professor Eric Wachsman, director of the University of Maryland Energy Research Center (UMERC) in the A. James Clark School of Engineering, are the foundation of a system being commercialized by Redox that provides safe, efficient, reliable, uninterrupted power, on–site and optionally off the grid, at a price competitive with current energy sources. The promise is this: generate your own electricity with a system nearly impervious to hurricanes, thunderstorms, cyber attacks, derechos, and similar dangers, while simultaneously helping the environment. "Every business or home should be able to safely generate its own energy," said Warren Citrin, CEO and director of Redox. "We currently rely upon a vulnerable electrical grid. The best way to decrease that vulnerability is through distributed energy, that is, by making your own energy on-site. We are building systems to do that, with an emphasis on efficiency and affordability. These should be common appliances." Enter Redox's PowerSERG 2-80, also called "The Cube," which connects to your natural gas line and electrochemically converts methane to electricity. Just larger than a dishwasher, the system sits comfortably in a basement, outside of a building, or on a roof, and—with no engine and virtually no moving parts—quietly goes about its business of providing power. The first-generation Cube runs off natural gas, but it can generate power from a variety of fuel sources, including propane, gasoline, biofuel and hydrogen. The system is a highly efficient, clean technology, emitting negligible pollutants and much less carbon dioxide than conventional energy sources. It uses fuel far more efficiently than an internal combustion engine, and can run at an 80 percent efficiency when used to provide both heat and power. Proprietary technical advances enable Redox to offer the Cube at a tenth of the cost of current systems. Combined with the increasing abundance and falling prices of natural gas, the company plans to offer electricity at prices competitive with current energy sources. Redox plans to release The Cube in 2014. The first version will be configured to 25 kilowatts, which can comfortably power a gas station, moderately sized grocery store or small shopping plaza. Additional power offerings will follow. 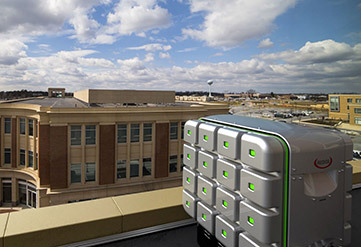 Using different-sized fuel cell stacks, the company can offer The Cube at 5 kW, to provide always-on electricity for an average American home, or up to 80 kW in one system. Cubes can also be combined to provide even more power in a modular fashion. Inside The Cube are stacks of small, ten-centimeter-square, millimeter-thick, solid oxide fuel cells. Like a battery, it has a cathode, an anode and an electrolyte, but the comparison ends there. Fuel cells don’t store electricity, rather, they create it, and they do so chemically, pulling oxygen ions from the air and conducting them through the cell, where they meet and oxidize the fuel on the other side, creating electricity. The materials of the cells are critical, and that’s where Wachsman's expertise lies. With more than 220 publications and eight patents, after receiving the Electrochemical Society High Temperature Materials Division's 2012 Outstanding Achievement Award and the 2012 Fuel Cell Seminar Award, his election as Fellow to both the Electrochemical Society and the American Ceramic Society, and serving as Editor-in-Chief of Ionics and editor of Energy Systems, Wachsman’s greatest contribution may come after a hurricane rips through the East Coast and our lights are still on. Two main problems have plagued solid oxide fuel cells: high operating temperature and high cost. Wachsman solved both. Conventional solid oxide fuel cells operate as high as 950 degrees Celsius to run effectively. At this high temperature, the system can’t be easily turned on and off, performance degrades, and the balance of the system requires expensive, high-temperature alloys that drive up prices. Wachsman decreased the operating temperature of solid oxide fuel cells to 650 degrees Celsius, with future reductions likely to 300 degrees. At these lower temperatures, the system can turn on much more rapidly, operate with greater reliability, and Redox can build out The Cube with conventional stainless steel parts rather than expensive alloys. But Wachsman didn’t stop there. Drawing upon scores of graduate and undergraduate students over two and a half decades, millions of dollars in research funding and a state-of-the-art laboratory at the University of Maryland, he created fuel cells that generate ten times the power at these lower temperatures than anything else on the market, cutting the system's cost by a factor of ten. He did this by tackling nearly every aspect of the cell. He developed dual-layer electrolytes using new materials and dramatically improved the anode so it can withstand cycling the system on and off. No part escaped his expert touch, and the entire family of materials he created allows Redox to build systems for a wider range of applications. "Over a 25-year time period, we have achieved major advances in both the composition of fuel cell materials and the micro and nanostructure of those materials," said Wachsman. "Putting these together has resulted in a cell that has an extremely high power density, on the order of two watts per square centimeter." Citrin recognized the breakthrough. More power means you need less cells to do the same work, which also means the systems that contain them can be smaller. "Wachsman's advances allow us to build systems that are literally an order of magnitude smaller, an order of magnitude lighter, and an order of magnitude less expensive than anything that has gone before," said Citrin. Wachsman started working on solid oxide fuel cells as a graduate student in the 1980s. He always intended for them to make it to market. As far back as 2005, he and then-Ph.D. student Bryan Blackburn began exploring the idea of forming a company. In early 2012 they entered the VentureAccelerator Program, an elite initiative of the Maryland Technology Enterprise Institute, or Mtech, that helps select University of Maryland inventors get their research out of laboratories and into industry by creating successful companies. After just three months, a record for the shortest time in the program, Wachsman and Blackburn teamed with Citrin and fellow entrepreneurs David Buscher and Robert Thurber to form Redox Power Systems. The team of five, all members of the board of directors, garnered exclusive rights to Wachsman's patents. Redox contracted research to UMD to further refine and improve the fuel cells. Previously, Citrin, Buscher and Thurber built Solipsys, a radar technology company, which was acquired by Raytheon 2003. Collectively, the trio launched 13 additional companies, including Gloto, a company that provides innovative products and services to drive consumer engagement experiences across ads, social, mobile, and interactive TV. In the future, Redox plans to produce fuel cell systems for automobiles, which the company claims could triple the gas mileage you get from your car. But for now, they will be happy if, after the next Snowmageddon or Hurricane Sandy or after a vicious cyber attack, we all still have power. COLLEGE PARK, Md. —Redox Power Systems LLC and University of Maryland researchers have partnered to deliver breakthrough fuel cell technologies for providing always-on electricity to businesses, homes and eventually automobiles, at about one-tenth the cost and one-tenth the size of current commercial fuel cell systems, university and company officials jointly announce today. The Atlantic: The Navy Has Fuel-Cell Generators; Will You Have Them Soon, Too? Green Tech Media: Could This Be the Fuel Cell to Beat All Fuel Cells?